.Traci Skene-- Comedian, Writer, Author: Why Did The Rooster Cross The Road? There were roosters at the lake today. One of them took a fancy to my husband. For a second, I feared he would follow us into our station wagon. Nobody else at the lake seemed to care that two beautiful roosters were wandering around right near the parking lot. Jeez, there's jaded and then there's jaded. I'm glad we're the type of people who still get excited when we see roosters at a place where roosters shouldn't be. 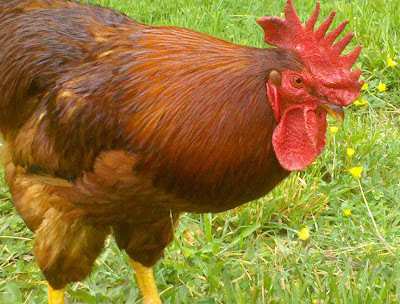 You're probably not happy that we're also the type of people who take pictures of said roosters then force them on others who we assume will share our enthusiasm.